The content on this page was commissioned by our sponsor, SAS. The MIT SMR editorial staff was not involved in the selection, writing, or editing of the content on this page. 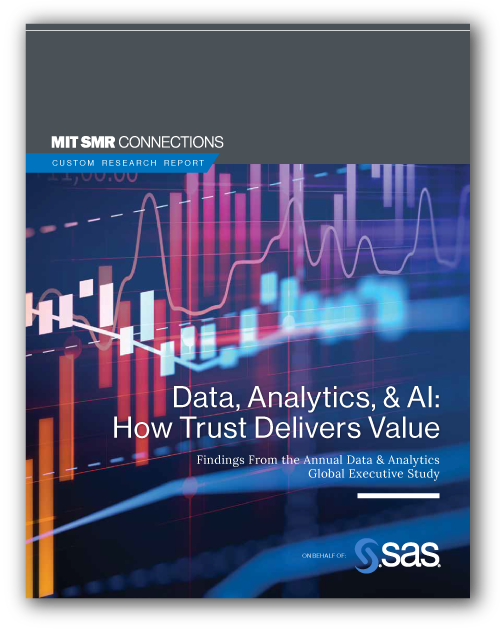 “Data, Analytics, & AI: How Trust Delivers Value,” the 2019 global report from MIT SMR Connections and SAS, explores how organizations are delivering more value with AI and analytics by building foundations of trust. The most mature practitioners are more likely to actively build trust in data, attend to customers’ trust in privacy and security measures, and foster cultures of trust in data-driven innovation. MIT SMR Connections is an independent content creation unit within MIT Sloan Management Review . The MIT SMR editorial staff was not involved in the selection, writing, or editing of the content on this page. Learn More.